Please share latest dumps of QoS Pass4sure. I did all exams (except 642-642) with the posted version above. I´ve passed every exam. Is 642-642 Version 4.82 still valid? Does anybody even replies back here??? anyone has the latest pass4sure of CVoice 642-436,here link is given for 5.61 version? I downloaded CVoice from here like 642-436( CVOICE) P4S v5.61 – 261 Questions but when I validated the current version of P4S through the procedure given by Careercert, I am getting demo version 3.10. Same I checked for 642-426 TUC paper, current version is 3.10 only. Kindly let me know which one is correct either downloaded version(5.61) or version through suggested procedure(3.10).In case if you want to verify then please have a look once. Thanks in advance to whoever give right advise here. anyone has the latest pass4sure of CVoice 642-436, have exam on 8 March 2010. Mr Janu..cant seem to access the links that you provided. are they still accessible? which one is best to use for getting the BSCI exzm P4S or testinside ? I have several purchased MS pass4sures (right before they stopped selling) for 270, 290, 291, 294, 620, 649 and Cisco 816, 822. Id be willing to donate the file to who ever cracks them. All the MS ones are the last versions they had and the Cisco are brand new (this week). Ill check here later. Let me know. Can you provide a screenshot of the services. i can't find DCOM Server Service and run the exam it ask for serial number and order number. Can you upload a screenshot of the services. I have installed P4S 642-426 in XP, I can not find DCOM Server Service, but I did change the volume ID to 5555-7777 but still when I run the exam engine it ask for Serial number and order number. I have downloaded the p4s software from the above link. Also guys, for how long will your CCNA Voice be valid since taking 642 -436 exam automatically gives you a CCNA Voice. Coz from the cisco website, this exam is also part of the 5 CCVP compulsory exams.???????????????? Wana ask the cost of taking 642 -436, is it same as each paper in ccnp ( $150) ???? Also how many simulation is in this exam???? Furthermore, is this Version 5.61 still valid ???? hats off for the effort for providing study materials for almost all popular certification exams. as many friends said above, if pdf format is also made available, it will be very useful. and MRJANU, thanks for posting P4S screenshots in pdf. I pass cvoice(642-436) with 988/1000 today. I study cvoice book,p4s,testinside.Here are the links for p4s(pdf)screenshot v5.61 with q-261 and testinside. 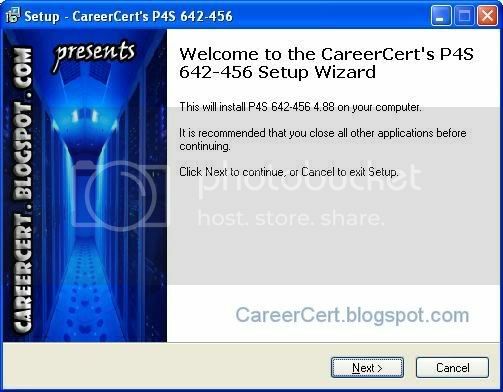 please anybody has last version of pass4sure for MPLS 641-611 exam 199 Q&A ? I plan to write 640-802 exam on next weak.I have P4sure 7.73.I need to know any new updates are released.I get from my fried on last weak the is some update.Pls give the information uif u have any latest dumps after 7.73.
in the meantime, can any please let us know if he passed any exam depending on these P$Ss? Can you post THESE links in pdf format…Please and thanks.